So I am officially jealous of all the cute shoes for kids. I don’t remember having cute shoes when I was a kid…just basic ones for everyday and a nice pair for church. Things have sure changed. Pediped has amazing shoes for kids. The selection is huge for both boys and girls. Since I have 2 little girls in my life now it wasn’t hard for me to browse the selection that Pediped has to offer. Sadie is still favouring her Pediped shoes that she received back in February and the good thing is they still fit thanks to the removeable insoles. We received two pairs of shoes for review…one pair for Sadie and one pair for Gracie Mae. Sadie’s were the Giselle style in Chocolate Brown. These shoes have become her new favourite in and out of the house. They have circles/dots on them in pink, cream and green and have a metallic shine to them which Sadie loved. Each pair of Flex Shoes comes with an additional 2 mm insole that you can put under the existing insole and remove as your child’s feet grow. This will give each pair of Pediped Flex an extended life which makes for a happy mom and a happy pocket book. They are great quality and very well made. A very durable shoe which all kids need. The support is great and the flexibility of the shoe helps keep blisters and sores away. The Giselle shoes retail for $45. Gracie Mae got to try the Addison Style shoe. The Neopolitan Stripe shoe was adorable. I think its the first shoe she kept on as she was anti sock and shoe when she first arrived. The Originals collection is for ages 0-24mths. It is a great first shoe for your little ones developing foot as they learn to walk. The Originals are very flexible and are the next best thing to walking barefoot. 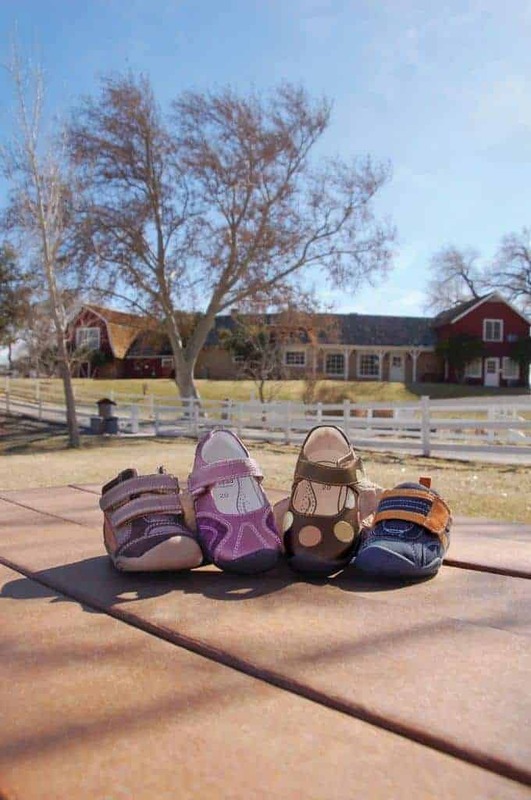 The shoes are easy to get on and off and are recommended by pediatricians and podiatrists. Pediped now has a complete footwear system and has added the new grip n grow collection. The grip n grow collection provides toddlers with protection and flexibility for their active lifestyle. Check out Pediped at www.pediped.com for more info. I joined you on the blog frog community.